2-2-2-2-2 hold bottom for 5 sec. "My six-pack is coming in." "The New Faces of Coke" by Ninjas for Health, Medium.com, and "The Money Spent Selling Sugar to Americans Is Staggering" by James Hamblin, The Atlantic. Nate Herndon's home gym, Columbia, Missouri. "Froning: The Fittest Man in History" will be available on iTunes Oct. 2, 2015. "2015 CrossFit Liftoff Powered by Rogue" announced for Nov. 5-9, 2015. CrossFit Training Summit, San Diego, California. CrossFit Level 1 Certificate Courses: CrossFit East County, CrossFit King of Prussia, CrossFit Omaha, CrossFit Park City, Iron Oak CrossFit, CrossFit Fury, CrossFit NCR, CrossFit New West, CrossFit Amsterdam, CrossFit Vienna The Loft, CrossFit LCS, CrossFit Brisbane, CrossFit Body in Motion, CrossFit High Pulse, CrossFit EMOM Villa Luro, Eglin, AFB, Florida. CrossFit Level 2 Certificate Courses: 810 CrossFit, Peak 360 CrossFit, CrossFit Strong, CrossFit Lutece. CrossFit Kids Course: CrossFit Dallas Central. Canadian 1st Class Constable Jennifer Kovach of Guelph, Canada, died March 14, 2013, when her squad car was involved in a motor-vehicle accident while she was responding to a call for service. The 26-year-old fulfilled her dream of becoming a police officer serving her community and the Guelph Police Service for four years before her death. Kovach is survived by her mother, Gloria; father, Bill; brother, Brian; grandparents, Chester and Elvira Janicki; boyfriend, Kyle Schlosser; and many other friends and family. 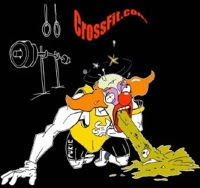 "NSCA Admits Publishing False Claims about CrossFit Injuries," The Russells. CrossFit Level 1 Certificate Courses: CrossFit Petworth, CrossFit Soul Miami, CrossFit Roots, CrossFit Mayhem, CrossFit Max Effort, CrossFit SAC, CrossFit TNT, CrossFit Jääkarhu, CrossFit X-Factor, CrossFit Colosseum, CrossFit Central London, CrossFit Basel, CrossFit Geraklion, CrossFit Long, Fuerza CrossFit. CrossFit Level 2 Certificate Courses: CrossFit Del Mar, CrossFit Atlanta, Reebok CrossFit Nuernberg. CrossFit Kids Course: CrossFit Downtown Atlanta. 2 reps EMOM starting at 65% 1 rm max, increase the load to 90% 1 rm max. Matthew Milone, Playa del Carmen, Mexico. "Here's a breakdown of the speech that won the 2015 World Championship of Public Speaking," Business Insider. Every minute perform 3 rep increase the load each round with max effort on last set. CrossFit Level 1 Certificate Courses: CrossFit Dallas Central, 810 CrossFit, CrossFit Garden City, Reebok CrossFit One, CrossFit Steele Creek, CrossFit Belltown, CrossFit Jax, CrossFit Takeover, Get Lifted CrossFit, TRAIN Manchester, CrossFit Twente, CrossFit FRA, Reebok CrossFit Officine, CrossFit Body in Motion. CrossFit Level 2 Certificate Courses: CrossFit Colosseum, CrossFit QDos. CrossFit Competitor Trainer Course: CrossFit St Louis Park. CrossFit Kids Course: Reebok CrossFit Bare Cove.